Welcome Home Series<sup></sup> handlesets are the perfect addition to your front door to create a unique and fashionable entryway to your home. Each is stylishly designed to provide maximum-security protection. There are many styles, finishes and configurations from which to choose. Square Pocket Door Lock The Polished Brass finish adds to the traditional look and feel of the product and makes a classic statement. Powerbolt 2.0 Deadbolt Lock in Satin Nickel Powerbolt innovated the keyless entry technology over 10 years ago and has stood up to the test of time. Simply enter your personalized access code for convenient keyless entry. Powerbolt is easy to install, program and use. And the motorized driven deadbolt allows for one-touch locking. It operates on 4 AA batteries and features SmartKey re-key technology as the back-up keyway. This single cylinder deadbolt can be locked or unlocked by using the keypad or key from the outside as well as the turn button from the inside. Powerbolt 2.0 Deadbolt Lock in Satin Nickel is rated 4.0 out of 5 by 4. Rated 5 out of 5 by MeMe from Great lock and easy to install Works great and was easy to install. Simple instructions. Rated 5 out of 5 by Marcel from Great product Easy to install and wish I had bought it a long time ago. Also easy to key it to your other locks. Rated 2 out of 5 by John from Won't lock. Purchased this lock a couple of years ago. Intermittently have had an issue where it refuses to lock. Can't even lock it with the key. To get it to work I have to remove the and replace the batteries. I know it is not under warrenty any more but over all I like the lock and appreciate that it has Wieser smart key. I would like to buy another one for the back door but not if it has the same issue. Has anyone else had the same problem. Rated 4 out of 5 by piper from Good lock --- but different then my other Weisers I received the lock on schedule. Installed easily and looks great. BUT... 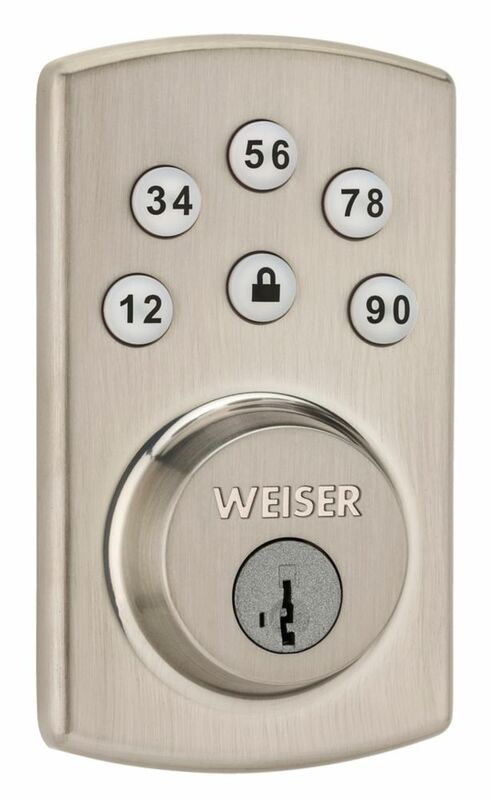 I have three other Weiser locks and the programming has changed. On my other Weiser locks I enter the four digit numeric code and the bolt unlocks. On this one you must enter the four digit code PLUS the centre lock button to unlock it. I know its a minor change but I always have to remember that this one is different. I was hoping that choosing all Weiser products would mean consistent operation but that is not the case with this model. Just be aware of the change especially if you're installing multiple locks on your property.